The two-liter EA113 TFSI engine appeared in 2004. It was designed on the base of naturally aspirated engine VW 2.0 FSI with direct fuel injection. The main difference between two engines is letter T, which means - turbocharged. That is not the only one difference, of course. The engine was reinforced to maintain a higher power. 2.0 TFSI engine has cast iron cylinder block instead of aluminum block. Inside the new engine block, there are two balancing shafts, another more sturdy crankshaft, new pistons and connecting rods for lower compression ratio. There is 16-valve twin-cam cylinder head mounted on top of the block. The cylinder head got new camshafts, valves, reinforced valve springs. The 2.0 TFSI is equipped with Variable Valve Timing system for the intake camshaft only, direct fuel injection, hydraulic tappets. The engine uses the small turbocharger BorgWarner K03 (max pressure is 0.6 bar), which provides high torque already from 1800 rpm. More powerful engine versions are equipped with a high-performance turbocharger - KKK K04. 1. High engine oil consumption. It is the usual situation with cars, which mileage is more than average. Often the reason is lousy oil rings or valve of crankcase ventilation. 2. Knocking, like a diesel engine. The reason is wear of camshaft chain tensioner. 3. A car doesn't accelerate at high rpm. This issue will solve by replacement the pusher of the high-pressure fuel pump. 4. Loss of power, horrible acceleration. The problem lies more often in N249 bypass valve. Many people prefer to remove N249 bypass valve. BPJ - 170hp (125 kW)/4,300 rpm; 207 ft lb (280Nm)/1,800-4,200 rpm. Application: Audi A6 (C6), VW Tiguan. That is the weakest version of 2.0 TFSI engine for Audi A6 and VW Tiguan. It has single turbocharger. BWA - 185hp (136 kW)/6,000 rpm; 199 ft lb (270Nm)/1,800-5,000 rpm. Application: SEAT Leon. AXX, BWA, BWE, BPY - 200hp (147 kW)/5,100-6,000 rpm; 207 ft lb (280Nm)/1,700-5,000 rpm. That engine version is for North American market also. Application: Audi A4 B7, Audi A3 8P, Audi TT, VW Passat B6, VW Golf Mk5 GTI, VW Jetta Mk5 GLI, SEAT Leon FR Mk2, SEAT Altea, SEAT Toledo Mk3, SEAT Exeo, Skoda Octavia vRS. BUL - 220hp (162 kW)/5,900 rpm; 221 ft lb (300Nm)/2,200-4,800 rpm. This is engine for the 2005 Audi A4 in DTM Edition trim. CDL - 220-265hp (162-195 kW)/4,500-6,300 rpm; 221-258 ft lb (300-350Nm)/2,500-4,400 rpm. That engine has different output in different applications: Volkswagen Polo R WRC, Volkswagen Golf MKVI GTI Edition 35, Audi S3 (8P), Golf R for Australia, Japan, Middle-East and North America, Scirocco R. The engine is the same BYD, but max boost pressure is higher - 1.2 bar. 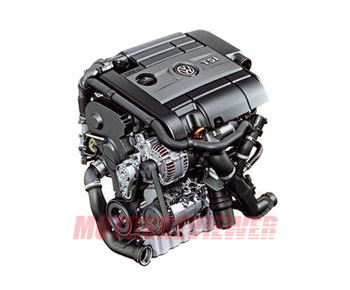 BYD - 230hp (169 kW)/5,500; 221 ft lb (300Nm)/2,250-5,200 rpm. Application: VW Golf Mk5 GTI Edition 30, Pirelli Edition. This engine has reinforced cylinder block, conrods, turbocharger KKK K04 (max pressure is 0.9 bar). BWJ - 241hp (177 kW)/6,000; 221 ft lb (300Nm)/2,200-5,500 rpm. SEAT Leon Cupra engines. BHZ - 265hp (195 kW)/6,000; 258 ft lb (350Nm)/2,500-5,000 rpm. Audi S3 (8P) engine. CDLA - 265hp (195 kW)/6,000; 258 ft lb (350Nm)/2,500-5,000 rpm. Application: Audi S3 (8P), Audi TTS, SEAT Leon Cupra R, VW Scirocco R.
CDLF - 271hp (199 kW)/6,000; 258 ft lb (350Nm)/2,500-5,000 rpm. That is a Golf R engine for European market. CDLF - 272hp (200 kW)/6,000; 258 ft lb (350Nm)/2,500-5,000 rpm. That another high-performance engine is for European Audi TTS.